Westfield, MA (November 21, 2017) – ProAmpac, a leading global flexible packaging company, was named 2017 Business of the Year by the Greater Westfield Chamber of Commerce at its 57th Annual Meeting and Awards Dinner on Wednesday, November 15th at the East Mountain Country Club. This distinction is awarded annually to both a business and a non-profit that have made outstanding contributions to the Westfield, MA, community. As part of the Westfield community for 46 years, ProAmpac has donated over $300,000 to more than 70 local organizations. In recent years, ProAmpac has reaffirmed their commitment to the Press Release community by investing in a large-scale facility renovation. This project included a 31,000 square foot facility renovation; replacement of the 200,000 square foot roof; improvement to the building’s airflow; and creation of additional manufacturing space. The Westfield facility employs 266 people and operates 24 hours a day, seven days a week. 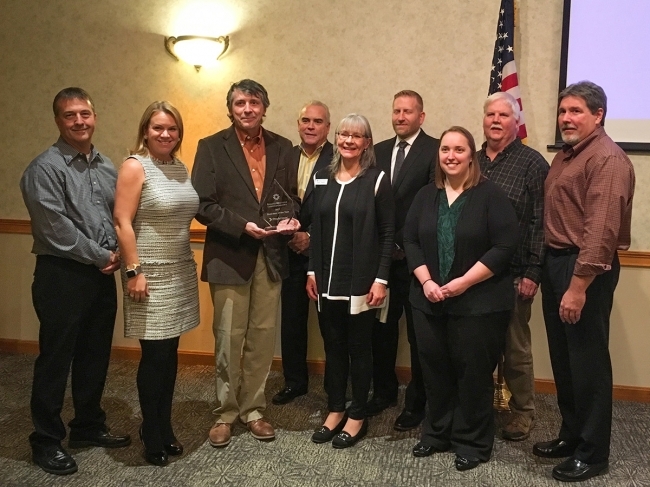 Accepting the Business of the Year Award from ProAmpac were (from left to right), Lenny Latour, Kristy Paulin, Brian Caraker, Jim Moltenbrey, Kate Phelon, Executive Director for the Chamber, David Wildgoose, Kate Rizzolo, Bill Keefe and Joe Simonowicz.